This costume was originally thrown together for Tekkoshocon and had to be ripped apart and redone for Colossalcon since I'd forgotten how many corners I'd actually cut. 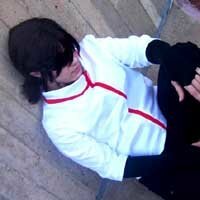 The white trim is left over from Seto Kaiba, the fabrics used for the bulk of it were leftovers from other costumes, the red lining of the coat and the white dress shirt were originally bedsheets, and the hand wraps were made from pillowcases. As far as patterning things, the coat used the collar from New Look 6163, the shirt was patterned from an old dress shirt, the vest was built up from a kid's pattern (and needs redone because I'm not happy with it), and the pants were made using the same pattern as the FMA military pants with minor adjustments made. 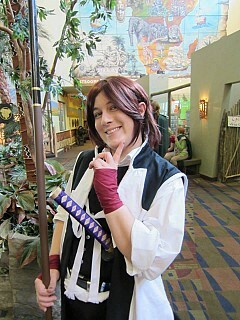 The sword is a $15 wooden Tensa Zangetsu that was repurposed, repainted, refinished, and rewrapped. The spear is a tension rod (so that it can be collapsed down to fit into a 4-door), foam, an empty spool of thread, a flat wooden circle, some hot glue, and some 15-minute epoxy.